Hanoi (VNA) – The Prime Minister has ordered concerned ministries and provinces to promptly carry out Decision No. 772/QD-TTg dated May 9, 2016 on providing emergency support for people affected by the mass fish deaths in central provinces. The order involves the Ministries of Agriculture and Rural Development; Finance; Industry and Trade; Labour, Invalids and Social Affairs; and Information and Communications; the State Bank of Vietnam; and the People’s Committees of Ha Tinh, Quang Binh, Quang Tri and Thua Thien-Hue provinces. The ministries and local governments must ensure the relief will be delivered to those in need without delay and in compliance with related regulations, in order to help fishermen, farmers and traders return to normal life and production and business activities. The mass fish deaths began in Ky Anh township, Ha Tinh province on April 6, then spread to Quang Binh, Quang Tri and Thua Thien-Hue. 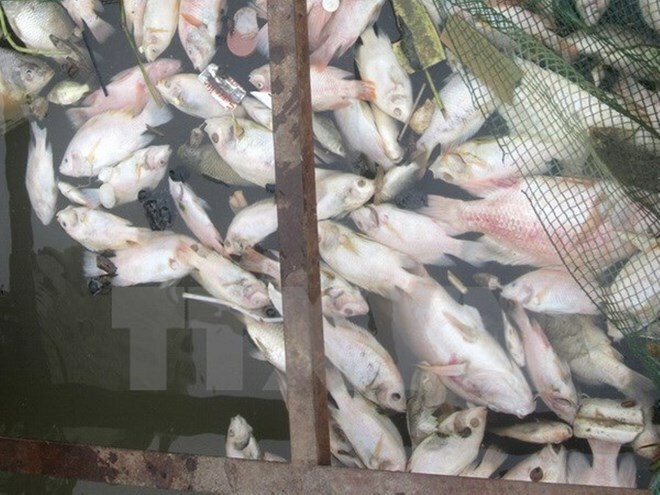 According to the Ministry of Agriculture and Rural Development, aquacultural farms reported 67 tonnes of dead fish while the volume of natural fish found dead was estimated at 100 tonnes. Prime Minister Nguyen Xuan Phuc on May 9 signed a decision to provide urgent assistance for farmers in the affected provinces. Accordingly, family members of fishing vessel owners and workers working on vessels and fishing logistics households are each eligible for 15kg of rice per month over the course of one and a half month. Up to 5 million VND (227 USD) will be offered to fishing vessels below 90CV which are forced to temporarily stop going out to sea.